My Inner Fatty: Chocolate pie... bar? What happens when 3 ex-rowers get their hands on 20 candy bars (don't ask how or why I have so many candy bars lying around)? Of course something stupid. Somehow, between Chris, Dominic, and myself, we ended up with about 10 or so bars of Nestle Crunch, 7 or so bars of Hershey's bars, and 4 or 5 packages of peanut M&M's. Yes we could've gone the lazy route and simply shoved them in our mouths, which we've done before. Nope, we decided to get slightly creative (albeit nothing earth shattering) and we melted all our candy bars in a makeshift double broiler. We then crushed our peanut M&M's and layered a pie tin with them. Working in layers, we alternated between M&M's and melted chocolate before we were left with a full tin of melted chocolate. After 30 minutes of thumb twiddling, we took out our masterpiece and sliced it. This was the end result. 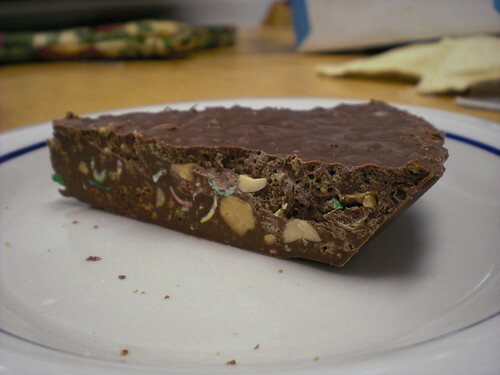 It's basically a richer Crunch bar with peanuts in addition to rice. Again, nothing incredible, but the sheer scale of it was nice. Chris had 1/4, Dom had 1/4, and I had 1/4... and the last bit of it for breakfast. Breakfast of champions. Does this qualify as a recipe btw? This is basically what Chocomize does, but with more exotic ingredients. Founded by former C150 rowers, so I felt I should at least support my former teammates. I wish people would tell me when they're in Taiwan. I'm usually super bored when I'm not eating, and I don't like eating by myself haha. Looks pretty legit(ly awesome) to me. Add a cracker crust and a nice big scoop of ice cream to make it part of a complete breakfast.